Free Love Forum takes you behind the scenes of the revolutionary new bootleg of the revolutionary new movie.Happy Holidays. digitalmediacamptoronto – What should the role of Canadian Public Broadcasters be in the digital innovation community? Yesterday I attended Toronto’s digitalmediacamp and the second session I attended was one that was considering the question “What should the role of Public Broadcasters be in the digital innovation community?” The question was posed by TV Ontario who also happened to be one of the sponsors of the event. I was glad to see such a question posed because the integration of broadcast TV into digital interactive media something I have a keen interest in as well as a long history. For the most part the integration of digital interactive media and television has not gone as far as it should have over the past decade. While most commercial broadcasters have integrated websites as part of each program they transmit, it’s done primarily to promote the program. Recently broadcaster’s websites have started to become playback repositories for regular viewers who missed a program because of televisions appointment-based model. These web based repositories allow viewers to watch recent episodes via the broadcaster’s website. Commercials are often inserted in the breaks of these webcast replays but it’s a situation where everyone wins, especially those consumers who don’t have a PVR. With that in mind it was no surprise to me that the conversation with TV Ontario formed around the relationship between the broadcast program and their associated websites. However, missing from the conversation, were two very important new technologies that could hold major opportunities for those in the digital media community in Toronto. Unbeknownst to many digital media producers, including those who create corresponding Internet content, television sets have just started arriving in Canada that contain an Internet connection. In a nutshell the sets provide direct access to services like YouTube, and provide widgets that will deliver Internet content directly to these high definition sets. The widgets that act as the front-end for services such as FaceBook and Twitter that also bring social media into play as well. In many ways these sets are the “killer app” that eliminates the BDU and allows content to be delivered via the Internet directly to the home TV set without any special set-top box. When this technology becomes mainstream it will allow digital media content producers to deliver video content directly to the consumer. Rather than go into a long diatribe about how radical this technology is I’d invite you to view the video at http://bit.ly/6z5A58. The video is from a SMPTE meeting that I hosted last week and I think any digital media producer that watches the video will see the disruption that this technology delivers to BDU’s and opportunity that this new technology offers to get content directly into the marketplace. Leaping over the entire broadcast infrastructure is something that I think many a digital media producer has dreamt about. ATSC Digital Mobile Television is something that is a little more abstract at this point. It also sounds a little geeky which is the reason why many people, even those working in the television industry, I’ve not heard much about it. In a nutshell mobile television is an addition to the ATSC standard that currently delivers free over the air digital television, namely high-definition television, to TV sets. The addition of the ATSC Digital Mobile Television service will allow DTV transmitters to deliver separtate streams of video along with digitally-based materials as well as the TV broadcast. The mobile delivery is specific to devices such as cell phones, mobile PDAs and any future media device that might come along and the signifigance of the standard is that delivery of data is maintained as the mobile devices move around. The video it uses is MPEG-4 based but its not just a television transmission medium. Because ATSC is digital it can transmit music, multimedia, print materials and whatever else is being delivered by today’s Internet. Amongst the many things that this technology opens up is television and media delivery to a very mobile population. And it’s not just hand-held devices, it can also be cars. Because of my technical background and the position I’m in within Ryerson University, I gain some unique insights so it came as no surprise to me that I came to the conference with this unique vision. Communicating the idea in such a diverse group is difficult. However it turns out this is one role key role that a public broadcaster can play in to assist in developing Innovation within Toronto’s Digital Media Production community. The ATSC delivered content is specific to the area of digital broadcasting and the development of knowledge, especially how to create content, will be crucial in the next few years as television becomes both interactive and mobile in the digital media space. One thing I proposed to TV Ontario was the concept of them becoming an innovation center of some sort in this area. My thought was that they would open up their transmitter to the digital media community so specialized content could be developed in an experimental form. The content might be specific to the area of educational programming and content that fits in with the emerging interconnected and mobile future of television broadcasting. An innovation effort of this type would work two ways. It would assist TV Ontario with a better understanding what new content delivery opportunities exist in this new media landscape. By partnering it would provide local digital media content producers with the skills to develop this type of specialized content. As ATSC mobile becomes mainstream it would assist the Toronto Digital Media Production community by putting them in a first to market position. They would be armed with knowledge that would help them operate successfully within this new paradigm especially if it rolls into the mainstream. To undertake a project of this nature would require the cooperation of different sectors of the Toronto digital media production community. No single digital media production company could undertake the knowledge development in this area because quite frankly they don’t have a digital television transmitter. Likewise, I think it’s safe to say, that TV Ontario doesn’t have a large staff to develop the specialized knowledge on their own and the organization would benefit from interaction with the Toronto community, especially in the area of ideas that would help their own educational content work with the new medium. When the Americans switched over to digital television, there is little doubt that Public Television, by way of PBS, led the way in the digital conversion. In many markets they were first to market not only with digital transmitters but with other technologies associated with HDTV such as sub-channels and data delivery using their digital transmitters. In Canada we’ve had no such leadership from our broadcasters. Sadly, TV Ontario is the last over the air broadcaster in Toronto to invest in a transmitter for HDTV. It’s yet to happen and from what I understand nothing has been finalized. For them, having just converted all their production facilities to make them HDTV capable, the issue is around government money to upgrade their transmitters. It’s bizarre to me that TVO viewers will probably have to pay their BDU’s not only for a basic fee to see the channel but the additional fee associated with HDTV charged by our BDU’s. If any outfit in Toronto could use some partners to help strengthen their case for the Government to invest in these transmitters, I think its TV Ontario. So I’m hoping the discussion that started on Saturday will continue and it would be great to see TV Ontario as part of an Innovation environment in partnership with the Toronto Digital Media community. TV Ontario is not the only public broadcaster in the City of Toronto. The CBC, along with the cable companies community channels are two other outlets. From my point of view it should be the CBC that takes a similar role across Canada in the development of digital television content such as PBS did in the United States. However their budgets have been cut substantially and this kind of development is not something that should be done from existing funding models. It’s something the Government of Canada has to provide additional funds to the CBC for as well as a mandate or framework to work with the Toronto Community. They have two digital transmitters for their English and French services here in Toronto. They are well set-up and they have the capacity to undertake some experimentation. As for the community channel, I really liked the suggestion at the recent CRTC hearing that community channels be separated from the operation of the local cable company. The proposal called for the cable companies to provide the funding for the channel and program producers to apply for the funding to put the programs on the channel. I gather the channels would relocate and operate independently of the cable companies themselves. Personally I’ve always been suspect that community channels are overseen within the context of a distribution company. I think freeing them from that environment will change the channels substantially. Over the past few years my Rogers Channel 10 has started to look like many of the other local broadcasters in the city. It’s been my contention that the community channel should be somewhere between what it is now and YouTube . It’s only an opinion of mine but I can’t see that conversion taking place under a corporate umbrella such as that found in organizations like Rogers and SHAW. In some communities that separation from the Cable company might allow for the stations to apply for over the air television licenses in the same manner community-based FM stations do today. This would then allow for more free over the air public television, and the opportunity to experiment and grow content in this new connected mobile television space. Are all these thoughts just a dream? Maybe! In a city that contains most of the head offices for English broadcasting networks and the various BDU’s for Cable and Telcom, it’s amazing how little cross pollination amongst the communities occurs in hopes of developing new opportunities. But if we are ever going to answer the question put forward by the conference: “How can we work together to propel Toronto’s technology, content and design communities into the future and make Toronto a globally competitive hub of digital media entrepreneurship and innovation?”, we have to dream. We have to dream big and look to corporate support for our communities development in the same way we look to government to do so. I look forward to continuing this dialogue as the follow-ups to the weekend’s conference get underway. Will Toronto’s digitalmediacamp Help Better Focus The Understanding Of The City’s Digital Media Industry? For me the conference or “un-conference”, as they are known, was déjà vu all over again. Quite frankly, and this is no one’s fault but my own, I have not been active for a number of years in the Toronto Digital Media Industry primarily due to the double cohort that hit the universities some years ago and the fact that I switched my focus both locally and internationally to the Society of Motion Picture and Television Engineers for the last few years. I’m the Education Director for the organization. The reason that I felt I was living a flashback occurred in the first session I joined. 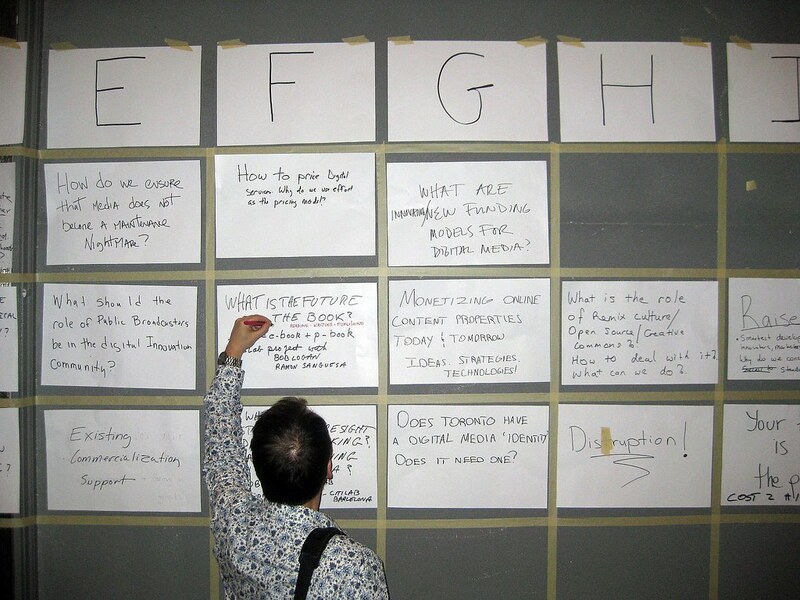 It asked the question “What has caused previous initiatives aimed at collaboration too, not fain traction or fail?” In it I heard that Toronto still suffers from a very fractured group of companies and entities that work in digital interactive media. It remains difficult for federal, provincial and municipal governments to focus and understand how to further develop the industry. This was the exact same thing that was being said 15 years ago when associations like IMAT, SMART Toronto and later the Toronto Technology Center were formed for the specific purpose of creating a focus and providing a voice to the community. As I exited the community to take my sabbatical Interactive Ontario was starting to pick up steam and provide some focus. So I was really taken aback when I heard pretty much the same discussion I’d heard twenty years ago still occurring as we hit 2010. Toronto is blessed with really good talent in many of the areas required to commercially deliver digital media. Yet on the surface the community appears to remain disorganized and perhaps dysfunctional when viewed through a government development lens. However it strikes me that perhaps it’s not that the community is disorganized or dysfunctional, perhaps instead the community reflects a rapidly changing landscape that is at the very heart of what digital media is. Think of it, where was Twitter as an active communication tool just two years ago and yet today at the conference it was central to the way many communicated. Unlike 10 years ago, the community now operates inside a landscape that is very collaborative. 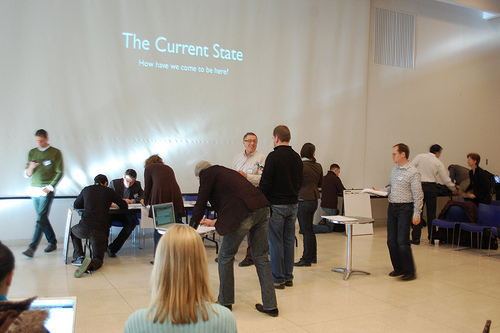 A BarCamp by its nature is heavily self-organized. It requires a small group of people to organize it, and get the word out. All the registrants book online and other than the theme and a good moderator, the participants decide what questions are up for discussion. The participants break into groups and focus on ideas around the question. With mainstream collaborative tools now operating at the base of the community I think the tools might be in place where a sustainable conversation might occur long enough and deep enough to form the focus that appears to be missing. Perhaps Torontonian’s who work in digital media fields need to seriously think about using them to organize and focus the story of the Toronto digital media industry. Having watched a number of brick-and-mortar organizations form and disband over the last 15 years I’ve come to realize that sustainability of these kinds of organizations is something that the Toronto digital media industry culture has been unable to sustain. The world of 3D appears to be coming at us at lightning speed on many fronts. The Nokia N900 is a powerhouse mobile device where 3D renders under WebGL. Check out the video below of a WebGL-enabled Firefox build that renders some complex 3D models. WebGL is still in the process of being standardized and it hasn’t gotten beyond Firefox nightlies to the desktop yet.